Join Us!!! We are looking for someone to help us cover Asian Games basketball. Please send us an e-mail. China outscored Iran by 16 points in the second half en route to an 84-72 comeback victory in the 2018 Asian Games men's basketball gold-medal game Saturday in Jakarta, Indonesia. Abudushalamu Abudurexiti (203-SF-96) led the offensive charge with 20 points. Fang Shuo (188-G-90) (16 points), Rui Zhao (193-F-96) (16) and Qi Zhou (217-C-96) (15) also reached double figures in scoring for the Chinese squad, which shot 52.7 percent from the field. Hamed Haddadi (218-C-85) scored a game-high 27 points for Iran. Mohammad Samad Nikkhah Bahrami (199-F-83) added 13 points, eight assists and five rebounds, while Behnam Yakhchali Dehkordi tallied 12 points and five boards for the runners-up. 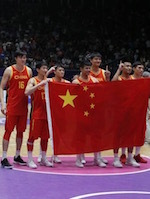 It's the eighth title for China in men's basketball across the past 11 editions of the Asian Games, including three of the past four since 2006. South Korea is the only other nation to win a gold medal in the event since 1978. Meanwhile, it's the second consecutive silver medal for Iran, which lost to South Korea in the 2014 final. The country also owns three bronze medals in the event but has never captured the top prize. 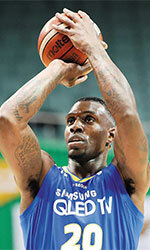 South Korea edged Chinese Taipei, 89-81, in the bronze-medal match earlier Saturday. South Korea managed to remedy its latest loss to Iran in Thursday's semis by securing bronze medal at the 2018 Asian Games after winning third place by defeating Chinese Taipei 89-81 in Istora Senayan, Jakarta on Saturday. Their victory was secured by the outstanding performance of its naturalized player, Ricardo Ratliffe (203-F-89, college: Missouri), who by the end of the match had scored 37 points, beyond his average in the tournament of around 29 points per match. Speaking after the bronze match, South Korea's head coach Hur Jae said he was proud of the team's achievement, although lots of evaluation was waiting back home. 'We were aiming for gold, but we fought a good fight. Therefore I want to thank all the [South Korean] players in this moment. There were some challenges in the tournament, but I am glad the players could get through it,' he said. The 52-year-old coach said the result in the Asiad would be a crucial factor in the team's evaluation for the upcoming qualifying round of the 2019 International Basketball Federation (FIBA) World Cup in China. Ratliffe, who joined the team earlier this year, said that the Asiad was a good experience for him as it was a different environment for him. 'There are ups and downs, but at least we can get a bronze medal,' he said briefly. Equally proud, Chinese Taipei head coach Charles Parker of the US said that he was upbeat with his team's achievement of getting into the semifinal and would take the result as a positive outcome for the country's basketball future.